Chicken Soup for the Soul: Tough Times, Tough People reminds us that tough times won't last, but tough people will. Tough People is all about overcoming adversity, pulling together, making do with less, facing challenges, and finding new joys in a simpler life. This new collection shares tales of people who have been laid off, lost their homes, and endured wrenching life changes, but discovered the underlying gifts in their new situations. More time at home with family, creative "staycations," more satisfying job opportunities, and renewed gratitude for health and life are just a few of the silver linings these survivors have learned to cherish. I have two copies of this book to give away. 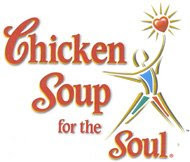 Go to the Chicken Soup For The Soul website and tell me another book you'd like to have! Please remember to leave links and User IDs for the extra entries or they will be rejected. Also leave your email in the comment if it is not readily available in your profile. This contest will end on August 1st at midnight EST. Winners will be drawn using Random.org, posted in a post here at A Simple Kinda Life, and will be emailed. Chicken Soup for the Soul: Campus Chronicles! I'd love Chicken Soup for the Baseball Fan's Soul! I entered the E-cloth giveaway! I would like Chicken Soup for the Soul Power Moms. I'd love Chicken Soup for the Soul: Teens Talk Middle School. I'd donate it to the middle school library in which I work. We have a few Chicken Soup books already, and they are immensely popular. I follow you on Twitter. I'm missanomaly on there.